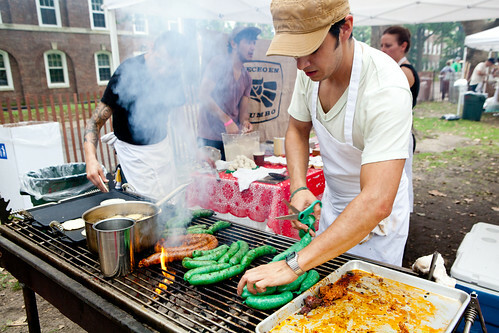 Pig Island II took place on Saturday, September 10, 2011 at Governors Island. 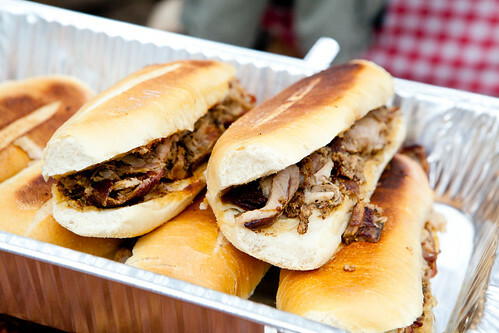 It was a humid, gray day from the start with a brief shower passed by around 1 PM but it never slowed down the pace of people coming to the island and eat their hearts out with food laced with roasted or smoked pork, with a few vegetarian dishes to appease that crowd. 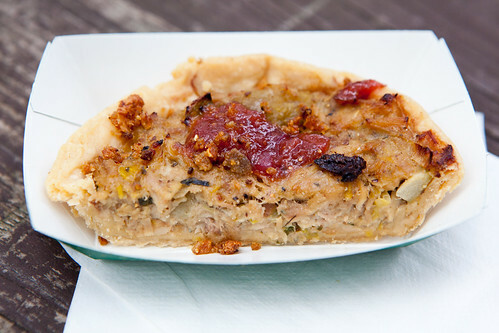 The pork pie made with leeks, garlic and topped with fig compote from Delicatessen was to die for. When I asked if they do serve this in the restaurant, the staff said they don’t but jokingly commented on starting a secret pork society. At any rate, if they do sell this pie, I would like to buy one – or half a dozen. This pie was super flaky like a puff pastry filled with densely shredded pork meat and the leeks intensified the pork’s natural sweetness. The fig compote on top made it ten times better, as it added moisture and the intense sweetness of the fig made my eyes rolled up in ecstasy. Palo Santo did great things with Latin street food. There were other restaurants that made chicharrón (deep fried pork rinds) at this event but at Palo Santo, they made it glorious. 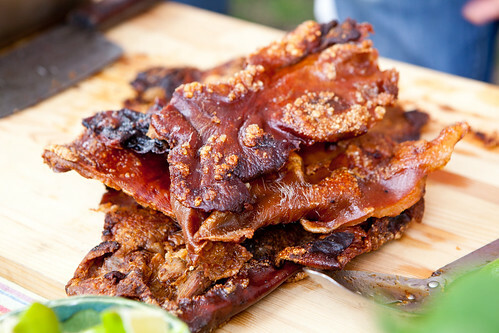 When you sink your teeth into these sheets of mahogany browned, crispy pork skin you can hear the mellifluous sounds of crackling and crunching between your teeth. It’s pure bliss to much on and I wish I had that entire pile to munch on all day. 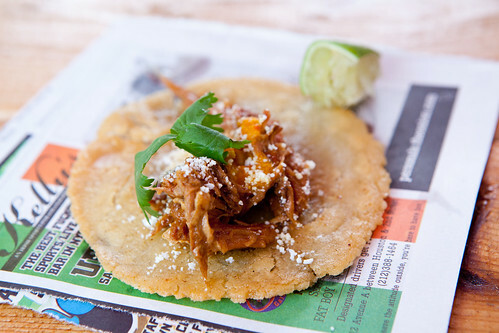 Their pig’s head taco is how I would imagine eating on the streets of Mexico, or Los Angeles. Fresh house-made corn tortilla (you’d see they had a huge tray filled of rolled balls of masa harina) topped with melt in your mouth pig’s head meat with a do-it-yourself condiment bar. I ended up topping mine with a touch of their house-made hot sauce, fresh cilantro, a dusting of cheese, and a squeeze of lime juice. 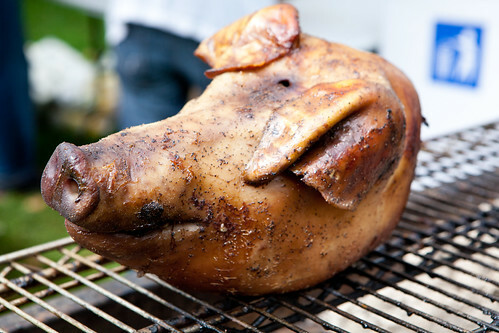 It’s juicy, greasy and simply delicious. The small drawback was that my taco did fall apart, possibly because of too much liquid in my taco. 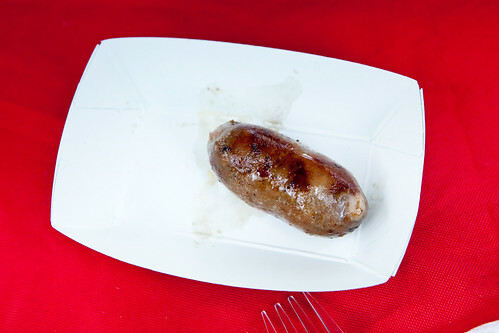 High Plain Bison had a simpler set up by serving two different sausages – hickory smoked and beer & cheddar bison bratwurst. 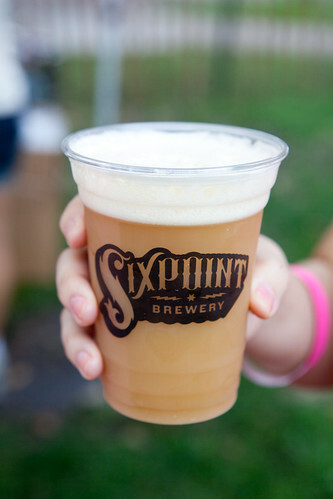 Both were very juicy and the casing did have a nice snap but the liquified cheese with the light hop-py beer flavor made it so much tastier. I admired JoeDoe for having an ambitious menu. 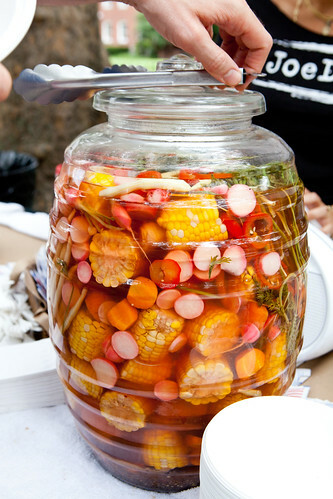 They pickled almost everything that was available in the late summer like their sweet and tart nectarines to that huge glass jar full of corn, radishes, jalapeño, carrots, and large stems of whole parsley sitting in a vinegar and paprika-based brine. The cubano was quite good as well. 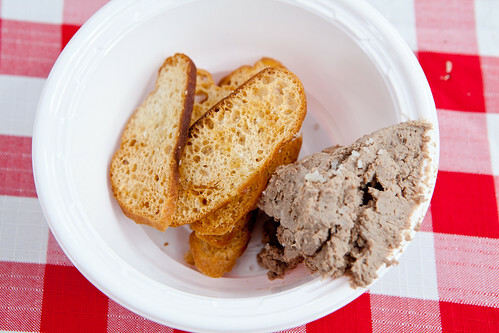 The pork liver pâté sprinkled in with gray sea salt was incredibly rich and liver-y. The event left me very full that I didn’t need to eat dinner at the end of the day. All I craved was my digestif of sorts, my shot of espresso which I ended up getting in Manhattan. It was all good fun and a goodbye barbecue party of sorts to the summer.